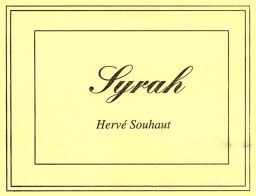 The Syrah grapes come from a tiny parcel of land along the slopes of the Doux River and the vines are on average 50 years old. This beauty has a most expansive and pretty profile – violets, black cherry, flowers and wet stone all billow out of the glass. The palate echoes the aroma and the tannins that gradually frame the finish are in the featherweight division and only serve to highlight the vibrant components of this lithe, fresh and captivating Syrah. So good ! The methods of Jules Chauvet are followed here, which is to say grapes are hand-harvested and then the whole bunches undergo a pre-fermentation maceration at low temperature. Fermentation follows using natural yeasts in wooden and concrete tanks – the wine is then aged on fine lees in seasoned oak casks for eight to twelve months. Following that there is just a teeny dose of sulfur at bottling, which is done without filtration.